← November at your farmers’ market…..
1 Heat the oil in a heavy based pan, add the leek, potato, garlic and rosemary and sweat over a low heat for 5 minutes until softened but not browned, stirring to stop sticking. Add seasoning with 1 litre of cold water, bring to the boil and simmer for 10 – 12 minutes until the potatoes are nearly tender. 2 Add half the chickpeas to the pan with their cooking liquid, return to the boil and cook for a further 5 minutes. Check seasoning. Whizz the soup in the pan with a stick blender until almost smooth then add the remaining chickpeas and simmer for a further couple of minutes. Check seasoning. 3 Spoon into warm serving bowls and serve with extra virgin olive oil for drizzling and grated Parmesan. Cook’s tip: Dried chickpeas do have a wonderful flavour and texture, they seem to whiz up all silky smooth and satisfying in this soup, and when I am feeling particularly organised I might just get round to soaking some overnight. Just cover 200g dried chickpeas in cold water. Drain then put in a pan with plenty of fresh cold water to cover and flavourings of an onion, carrot, celery stick and bayleaf. Bring to the boil and cook for an hour or two until tender. Use the cooking liquid in the soup. I might cook a big batch and toss any leftover chickpeas in olive oil then cover and keep in the fridge for up to three days for salads and stews. Or make hummus and put it in the freezer – a tip I learned from really talented local caterer Lili Jahanbani, who cooked wonderful vegetarian food for me at a recent yoga weekend with inspirational teacher Simon Low at Commonwork Farm near Sevenoaks. This entry was posted in Recipes and tagged chickpeas, Commonwork Farm, in season, Leeks, Simon Low, soup. Bookmark the permalink. 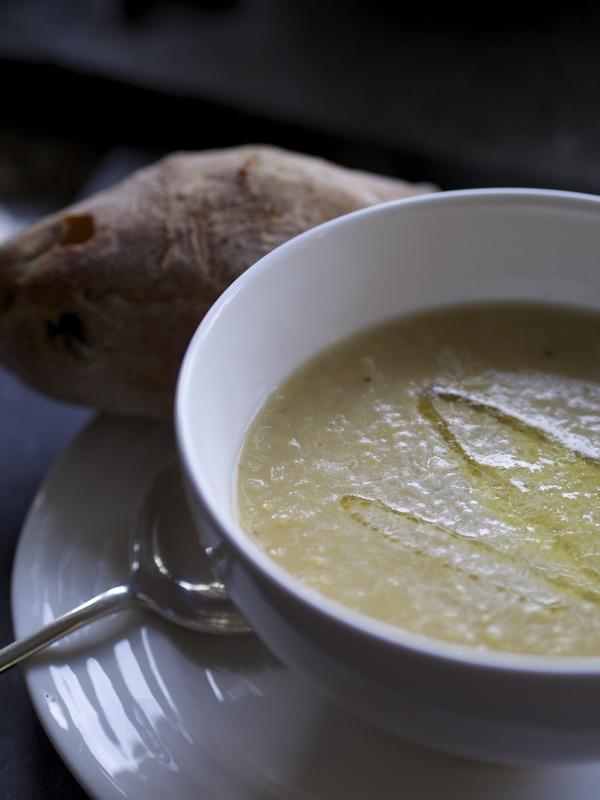 2 Responses to Drizzly cold weather calls for warming leek, chick pea and potato soup…. Just what I feel like on this cold miserable day! Reblogged this on Old Dog. New Tricks.